When we began homeschooling in the Montessori method well over 5 years ago, there were only a handful of Montessori moms on the internet. I had to do a lot of study and research to really understand what it meant to be Montessori and how to make that work at home. Overtime the number of Montessori homeschoolers has grown exponentially as more and more parents learn and share about their experiences. In that same time, however, I’ve noticed a drifting away from purity of Montessori on the internet. I have to look a lot more carefully and a search of the term “Montessori” might not yield anything remotely resembling the materials and activities available in the original Children’s House. This list is a collection of some of the common misconceptions I see and my thoughts on them, including many that I have admittedly perpetuated at one time or another. 1. Montessori is not a collection of nice wooden toys. Just the other night, a mom was telling me about these awesome Montessori materials she bought at a garage sale and how she loves them with her preschoolers. I excitedly asked which materials they were and she described a fairly common shape sorting/stacking toy. Dr. Montessori designed her materials for an exact purpose and not just anything made the cut. Along the same lines, our Montessori materials are not designed to be used as common toys. Originally knocking down the pink tower was a part of the activity, but Dr. Montessori found that the rough and tumble action disrupted the learning environment of the classroom and eliminated that activity from instruction. Blocks are great learning and exploring toys, but the pink tower and brown stair are not blocks. 2. Montessori is not worksheets laminated, cut apart and placed on trays on a shelf. I’m definitely guilty of this one at times when we were limited on space, but as I said before the materials are specific. Making a worksheet reusable doesn’t make it less of a worksheet. Putting it in a basket on a shelf doesn’t make it Montessori. 3. Montessori is not fundamentally thematic or seasonal. This actually goes along with #2. The Montessori environment isn’t designed to have big changes throughout the year. The materials should be a constant in the child’s life. Something they can rely on and return to for mastery. I think of the way my older children are anxious to spend part of their day teaching their favorite lessons to their younger siblings. Transient worksheet trays and big seasonal changes inhibit those connections to the materials. The exception to this would be practical life and available art materials. Changing out transfer medium or introducing seasonal elements into practical life and art can be a way to embrace the seasons without redoing your entire classroom. 4. Montessori is not un-schooling. I’ve actually written about this before, here. It’s interesting to go back and read my words again, because I find myself nodding my head to myself in some places and seeing other places we have grown. I definitely find we are taking the materials more hand in hand these days, but I will say more about that in a moment. Montessori is different from unschooling primarily because while the child drives the instruction in Montessori, it is still very teacher directed. From observing students and choosing lessons to preparing the environment, the Montessori guide has a HUGE responsibility to the classroom and his or her students. 5. Montessori is not something you can learn on Pinterest. I’m sure that some of my readers just ruffled their feathers a little bit, and I apologize for that, but hear me out. There are some great resources available online for Montessori homeschooling families. Youtube has some great teaching videos and and there are even online training programs. That being said, I really believe if you want to do Montessori well you need a mentor. Someone who is either trained and committed to the method, or a super experienced Montessori homeschooling mom who has worked past her own bumps in the road. Someone to brainstorm “What Would Montessori Do” in this situation and situations will come up. I don’t believe the anonymous blogger (no matter how sure you are that you are that bloggers number one fan) is fit to do that. Be a resource, ABSOLUTELY. Guide you as you journey….not so much. Part of the reason being simply the point of this post in the first place- there is a lot of MIS-information abounding the internet on what is Montessori. Remember Montessori isn’t a copywrited term…anyone or anything can claim to be Montessori or Montessori inspired. That doesn’t mean they are. Know your sources. I never would have made it this far without a husband who is well trained and experienced and access to Montessori classrooms to see it in action before I tried it at home. 6. Montessori is not just good for preschoolers. I’m learning more and more about this all the time as my kids grow. Montessori materials and lessons change as children grow, but the philosophy remains just as valid as it was for our little ones. I’ve been particularly excited as I finally see my older boys taking off with the independent research I have heard so much about from my Montessori teacher friends for all these years. There aren’t nearly as many families homeschooling older children with a Montessori approach, so if you find a great resource be sure to share it! 7. Montessori is not a quick fix or a cure all. Montessori works over time. Over the entire sequence of elementary, a Montessori child will learn the same things (more actually) than a child in a school building with state standards, but at any given time they might be “behind” in one way or another. Moving your child from a traditional school to a Montessori school will not instantly end their challenges and not all challenges can be remedied by simply applying a new approach. Time and consistency remain vital factors to overcoming challenges. That said, if you are looking to consider homeschool with Montessori, I recommend you start with the articles and resources in my Montessori Homeschool Quick Start Guide. 8. Montessori sensorial has nothing at all to do with sensory bins. Sensorial materials have a specific purpose, yes, related to learning through the senses. Sensory bins are also related to learning through the senses. They are not, however, interchangeable. We have sensory buckets, but they are kept in a separate area from our Montessori “classroom”. They are special activities, not choice as other materials are. 9. Montessori is not an either/or but a both/and. This is another one I have written about before, here. Montessori is not materials or philosophy, rather materials AND philosophy. I will say that over time, as our family has grown and changed, we have really become more closely in tune with the beauty of the materials that work, just as designed so many year ago, without changes and adaptation. The love of the philosophy gave us a place to start and the materials did their work from there! 10. Montessori is not 9-5, 8-4, 9-12, or any other specific time frame. The beauty of Montessori is that the children have a purpose for learning. They learn how to peel a carrot or slice an egg and that has a purpose only when they are invited to come into the kitchen and help prepare a meal for their family. As a parent, we do a huge disservice to our kids when we limit Montessori with a set of times. We have a work period for school activities, yes, but it can’t end there. Without the opportunity to apply their skills, we take away purpose and eventually their drive for learning…the very thing that the Montessori method hopes to keep alive in our children for so much longer than other approaches. Obviously with homeschooling, the most important thing is that it works for your family. Nothing is inherently wrong with sensory bins (I use them too! 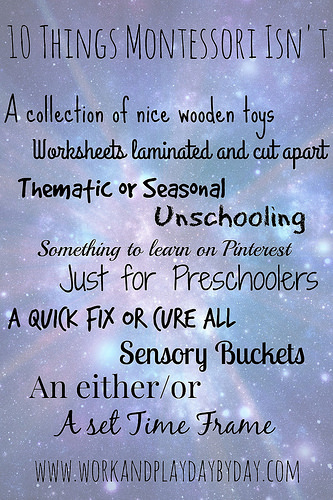 ), thematic activities (yup, we do those too), or wooden toys (I don’t have many others). I think in general, those sorts of activities are the best way for all children (preschoolers especially) to learn and incorporating them on some level is a good thing! In terms of “What is Montessori?”, however, those things simply don’t make the cut. Montessori is a philosophy, hand in hand with a specific approach to teaching lessons and specialized materials. Ready to begin homeschooling? Work and Play Day by Day offers a free beginning homeschooling worksheet.